Brenton Tarrant, allegedly live streamed the New Zealand mosque shooting on Facebook Live. (r) Brenton Tarrant, New Zealand suspected shooter, March 14. “I don’t really, I think it’s a small group of people,” Mr. Trump told reporters assembled to hear about his veto of legislation which would have stopped him from moving federal money around to fund his border wall. He had been asked if White Nationalism was a growing threat. Rep. Andre Carson, in interviews with CNN, said the president was again engaged in dog whistle politics and playing to an “extremist” part of his base. The Indiana Democrat, who is one of several Muslim members of the U.S. Congress, said the president knows what he is doing and who he is appealing to. Tackling White Nationalism and White domestic terrorists are not the priority in America, which has focused on so-called Islamic Jihadist movements, the Black congressman noted. Yet most terrorist deaths in America over the last 10 years have been committed by White nationalists and White supremacists. And, Rep. Carson and other analysts noted, as Mr. Trump talked March 15 about the need for border security he fell into old talking points about America facing an invasion of people, drugs and criminals— with these problems obviously brought into the United States by hordes of brown-faced people. As horrible as the lack of presidential leadership and empathy may be, the roots of this problem go much deeper than Mr. Trump. That’s the ugly truth Americans do not want to admit. So long as killers like Mr. Tarrant, who planned his deadly assault for two years and broadcast the March 14 slaughter of Muslims via social media in real time, can be dismissed as deranged losers and hate-filled social misfits, America can find a measure of comfort. Her comfort is in the denial of how close the killer’s views align with mainstream politics, White identity and sensibility, and some core White beliefs. Racial angst rises as the numbers of dark people grow and the number of Caucasian people sink and relieving that angst is clearly part of American mainstream thought. White people and Black people know and feel it. 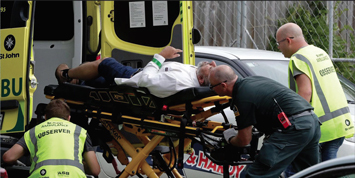 Ambulance staff take a man from outside a mosque in central Christchurch on March 15. And, while an Australian news outlet described Mr. Tarrant’s “Great Replacement Manifesto,” which was released online two weeks before the killings in Christchurch, New Zealand, as “a study in intolerance, hatred and the profound overriding fear that whites are facing extinction,” elements of it are part of mainstream politics and discussion in America and Europe. In all of these White nations,there is a debate about preserving identity and whether the growing migration or births of non-Whites can fit into White values, customs and traditions. So a New York businessman’s crass behavior, insulting and brawling campaign style and brash words touched Whites who felt abandoned and they decided to vote for him as president, said pundits. Their world was changing fast, their jobs, social and economic status had declined and they were frustrated, pundits added. He spoke of wasted taxes, uneven trade and the need for market protections to preserve jobs and economies—for Whites. He spoke of young White males feeling disaffected and rejected in their own countries and a loss of spiritual values, morals and the things that made the White world great. His rhetoric isn’t too far from those who back Mr. Trump and those the Democratic Party has an obsession with courting and a fear of offending. Railing against Muslims, immorality, taxes, identity politics and anti-America acts are a staple of Fox News, perhaps the country’s favorite source for news. These White Nationalist sentiments have federal law enforcement loathe to go after White domestic terrorists for fear of trampling on the rights of good Americans. After all, White males have the right to be angry, the right to carry weapons and the right to express their displeasure. Even if these Americans aim guns at federal authorities, as they did during the Bundy ranch stand off in Nevada in 2014 over a 21-year-old dispute about federal grazing land, they need understanding, mediation and respect. This same sentiment rejected a 2008 FBI assessment titled “White Supremacist Recruitment of Military Personnel since 9/11” which found a little over 200 identifiable neo-Nazis with military training. Daryl Johnson, a security analyst with the Department of Homeland Security, in 2009 alerted local police departments to a rising risk of terrorist attacks by the extremist right. Mr. Johnson’s report, issued just after the election of Barack Obama, set off a conservative media firestorm that claimed it disparaged troops and law-abiding conservatives. The report was pulled and Mr. Johnson’s office was shut down. Sliding scale White Supremacy means there is an acceptable range of White rage, White resentment and fear of a White backlash. It allows for the most violent to be rejected and condemned but does nothing to uproot the tree that produces this poisonous fruit.